Effective treatment of your heel pain and chronic soft tissue injuries! 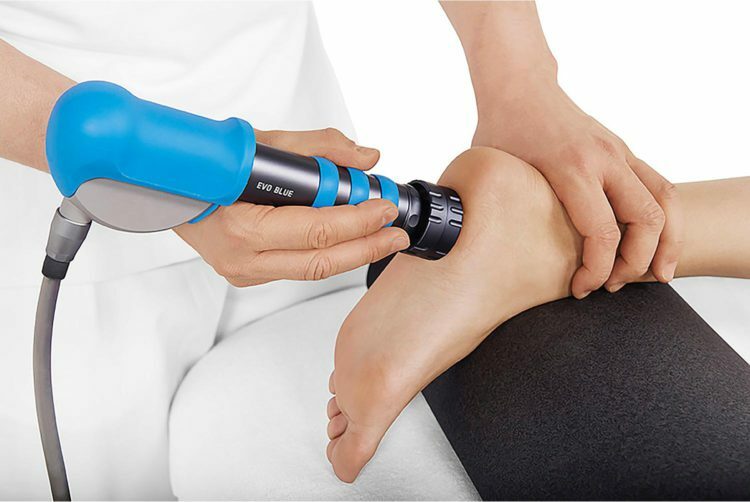 Walk This Way Podiatry is proud to provide shockwave therapy with our EMS Swiss Dolorclast system. Effective for a range of orthopaedic and soft tissue injuries, the Dolorclast is not only used by elite sporting teams but is also the official shockwave treatment for the Olympic Games. Radial shockwave therapy is the application of high intensity sound waves to chronic musculoskeletal injuries. When applied to an injured area these shockwaves provide pain relief by increasing blood flow, decreasing surrounding muscle tension and stimulating long term tissue repair. After a thorough assessment of your injury, shock waves are applied via a hand held applicator against the skin. The initial phase of treatment may cause some pain however this indicates correct targeting of the area. This is usually followed by numbness and heaviness in the area and the latter stages of treatment are more comfortable. The treatment sessions are up to 10 minutes in duration during which you may receive up 2500 pulses. Depending on your condition you may require 3 to 5 treatments each one week apart. Clinical studies for heel pain report a success rate of 80% when applied in three sessions or more. Don’t let your injuries get the better of you. We can about your health and fitness. Make an appointment for an assessment and shockwave therapy today!